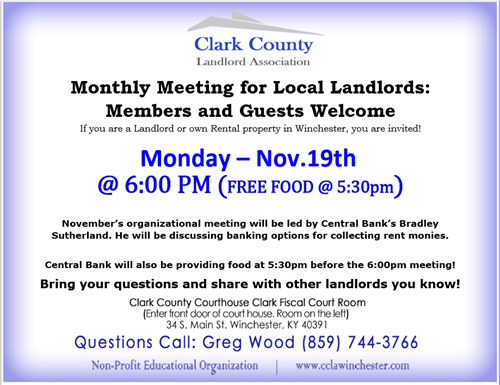 All local landlords and guests welcome! Our next monthly C.C.L.A. meeting will be MONDAY, November 19th, 2018 at 6pm (Weather Permitting). This month, Central Bank will be presenting on banking options for collecting rent monies. Bring your questions and share with other landlords you know! There will be a "meet and greet" time from 5:30-6 with snacks provided by Central Bank. If for any reason the meeting should be cancelled, due to weather or other, we will email everyone and let them know ASAP, so please keep an eye on your email that Monday of the 15th, OR call Greg Wood at 859-744-3766. Contact us at cclawinchester@gmail.com to ensure you are on the group email lists and never miss an update! Visit out website at www.cclawinchester.com. Want to become a member and have access to all of our forms, resources and high risk renter list? Contact us today! Fee is $50. Clark County courthouse fiscal courtroom on Main St. Meetings are FREE! Membership fee is $50.